No, I’m not talking about fog. 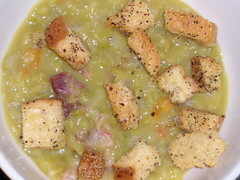 I love to make split pea soup with ham. If I’ve been by Heavenly Ham in Mercer Mall, I use one of their hambones, which are an astounding bargain, as they come with a lot of meat still on them (look in their freezer). I save most of the meat for sandwiches and use the bone with some meat still attached for soup. If I don’t have a hambone, I use a ham hock (you could also use a smoked turkey leg), but in that case I boil the hock in a kettle of water for five mintues, then toss out that water and start from scratch from there, to cut down on the salt. I usually make my split pea soup with chicken broth (the organic lower salt kind in a box), and I confess to even more laziness, as I always have a bag of Wegmans mirepoix in the freezer, so I throw in that nicely chopped trinity of onion, carrot, and celery. When I buy those ingredients separately, half of the carrot and celery ends up going bad before I use it all, so for me this is cost effective. I simmer all this with the peas for a good hour or more, the peas break down so no need to purée the soup. I pull out the bone, and separate the meat, discarding the bone and any visible fat. The meat goes back into the soup, and I serve it with my lemon-pepper croutons (cube bread, toss with a little oil, sprinkle with lemon-pepper spice, and bake ’til crispy). Or cornbread, or these great cheese rolls I’ve found recently at Wegmans. Mmmm good! But here’s a question: When I recently bought split peas, I noticed the organic Arrowhead Mills brand label claimed 4 grams of fiber per 1/4 cup. The Jackrabbit brand claims 11 grams per 1/4 cup. Huh? Anyone?